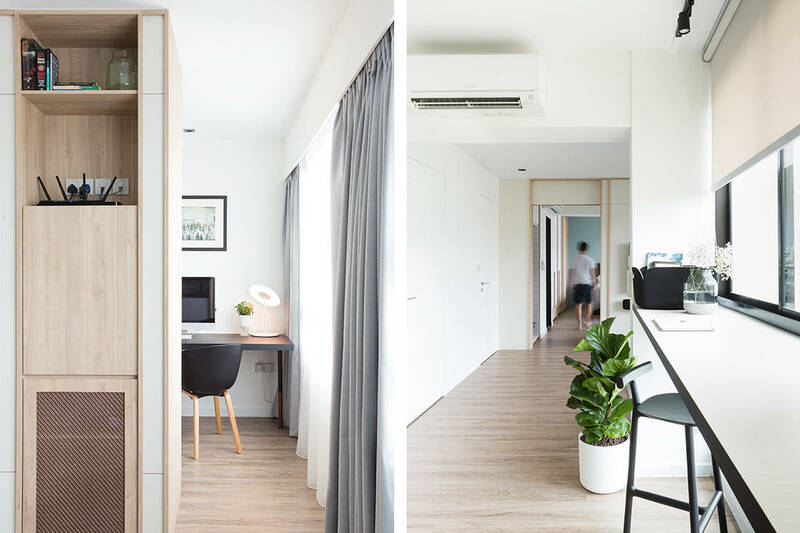 Since the homeowners weren’t particularly fond of this resale flat’s layout, they were open to restructuring the space. 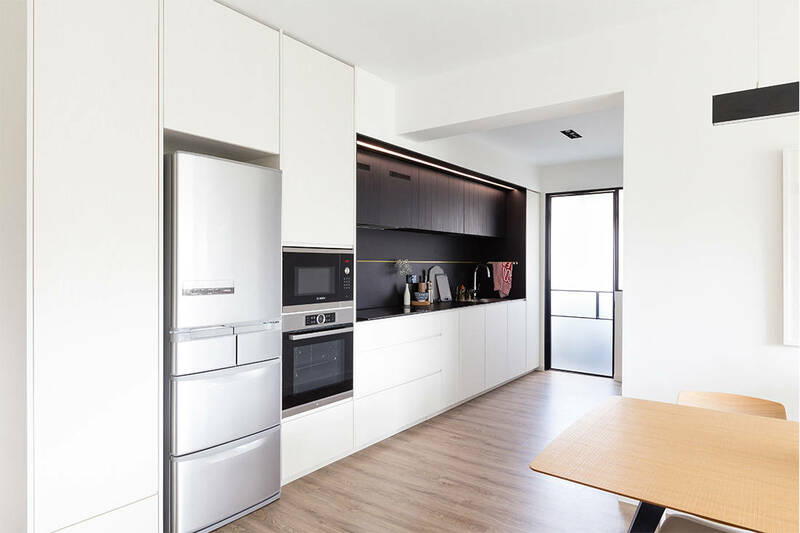 In the brief to Artistroom, the interior designers enlisted for the job, these points were discussed: The couple found the kitchen too small and oddly placed right in front of the entrance. 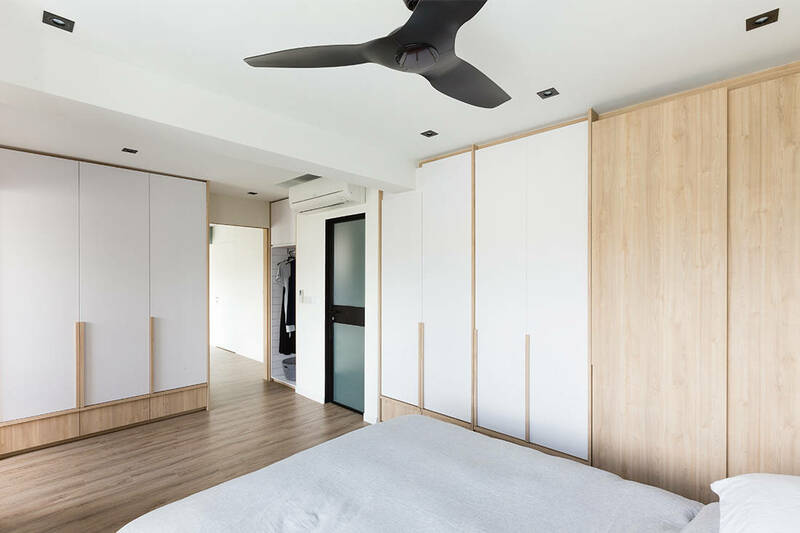 Plus, they wished for a more spacious bedroom with more storage and a larger en-suite bathroom. To summarise, they wanted their house to look big and airy, which lead Artistroom to hack all existing walls and re-plan the whole house. The initial investigation of the site threw up some interesting insight. In this typical resale 4-room flat, a small kitchen was enclosed while a dining table was located further away from it. 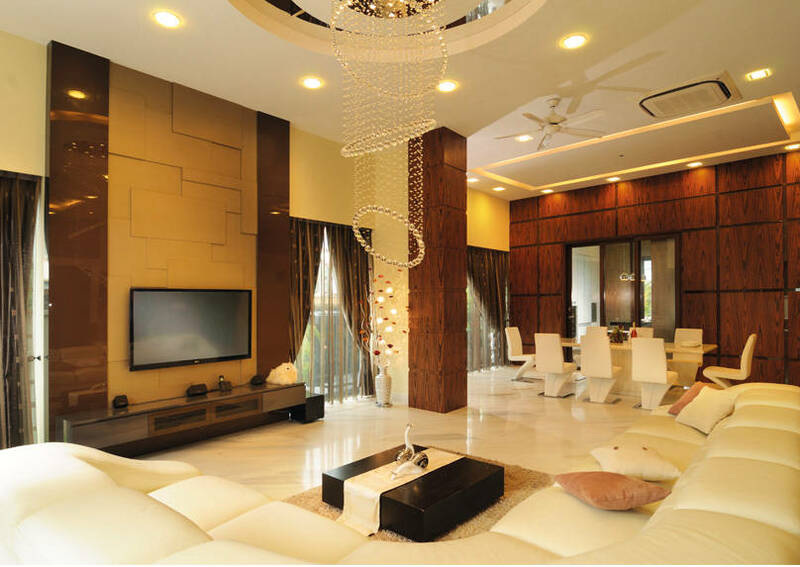 From the previous owners, a false ceiling and outdated colour palette made the whole house seem dark and dingy. There wasn’t enough storage and the electrical and air con trunking was visible. The design team at Artistroom set to work. For starters, they opened up the kitchen and closed up the yard with a metal and glass door. This also allowed natural light to brighten up the dark kitchen. 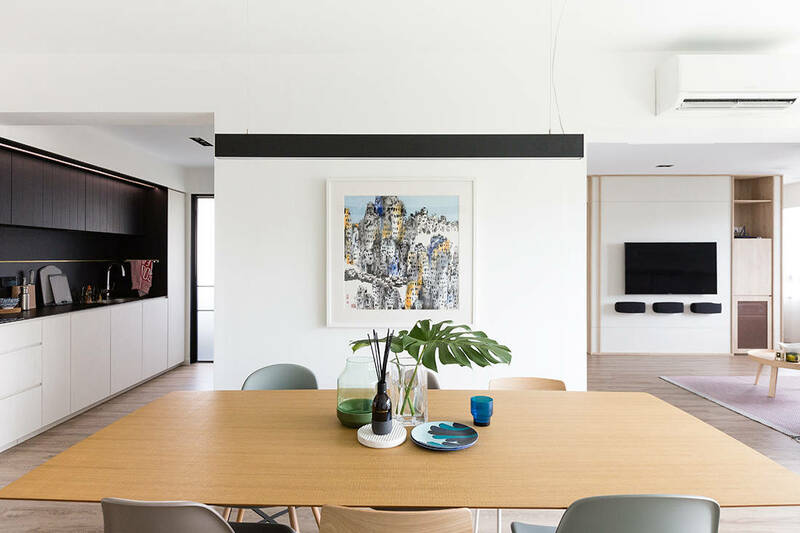 A long dining table made the transition from the kitchen to the living room seamless. The designers hacked walls from three rooms to combine the living space, master bedroom, and study area, creating one of the most notable features of this home. Artistroom created an island cabinet as a shared partition wall for these three areas. 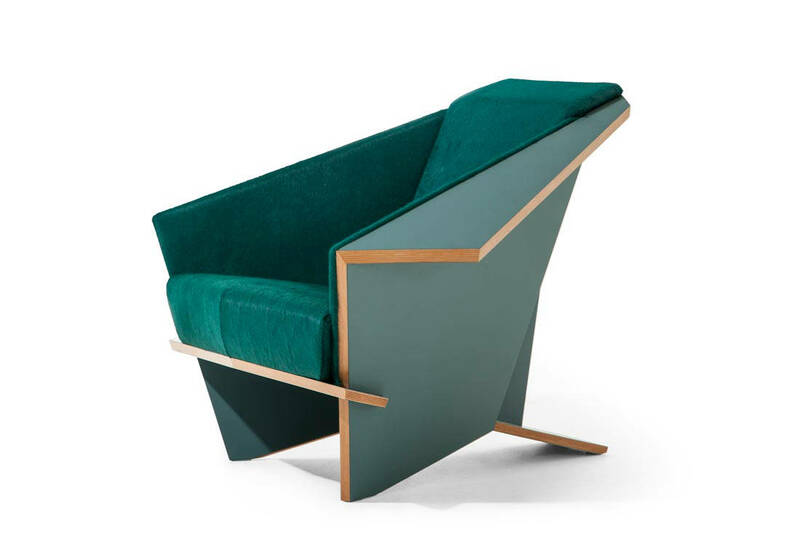 In the front, it serves as a TV console but turns into a storage cabinet in the study area. It also hides the pocket door to the master bedroom and study. 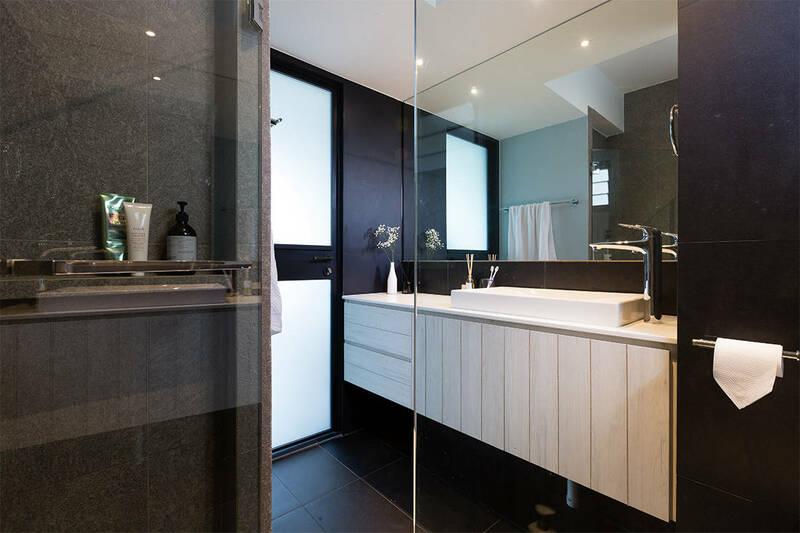 Since the couple found the bomb shelter unsightly, the designers built a false wall in white to help conceal the bomb shelter and common bathroom. Additionally, they extended the master bathroom to align with the wardrobe in the bedroom. This realignment prevented odd corners and saved on space. 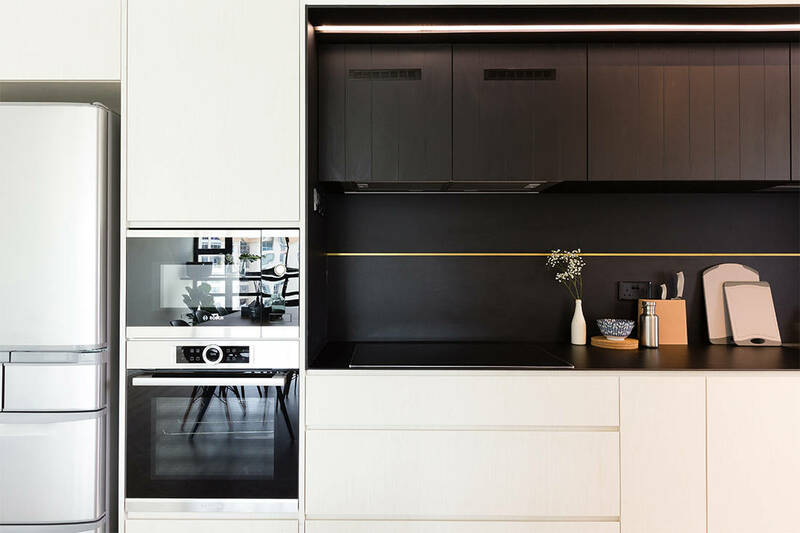 Talking about one of the challenges in designing this home, the team explain that while they hacked several walls and built smart cabinetry, they still had to match the owners’ budget. Hence they decided on to overlay the flooring with vinyl to cut some cost. Clearly, storage was one of the prime areas of interest. In the kitchen, Artistroom created a tall cabinet unit where the fridge, oven, hood, hob, and sink sat on one side. The other side was spared for storing shoes. Since the couple like cooking together, the kitchen was made roomier for ease of movement. This beautiful, airy all-white home is punctuated with light woody tones and pops of green. 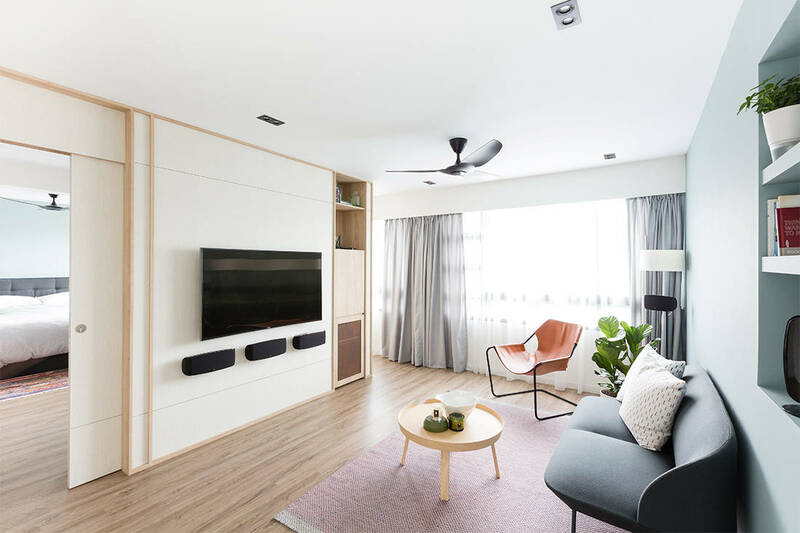 This zen colour scheme was picked as the owners prefer neutral, relaxing hues. Additionally, the window had a great view but was underutilised. To make the most of this feature, the designers built a wooden ledge at the window to act as a small study table or breakfast table. 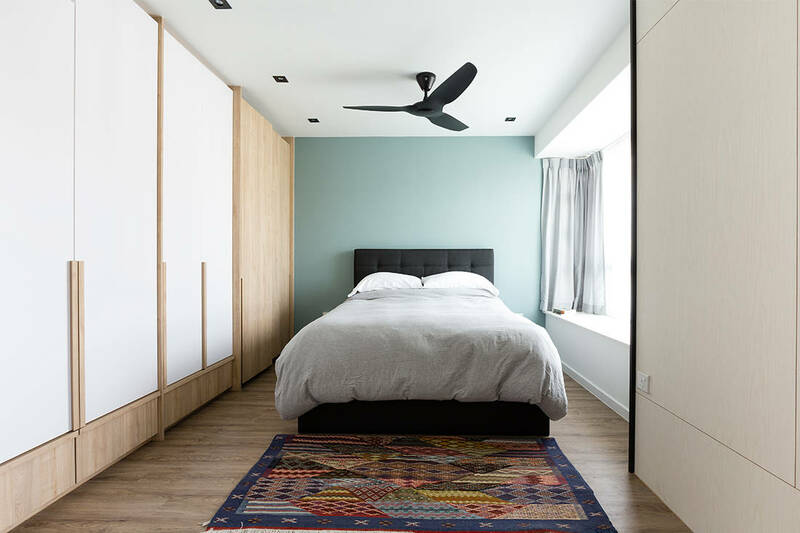 *This home was shortlisted for Lookbox Design Awards 2018 Most Dramatic Transformation category. 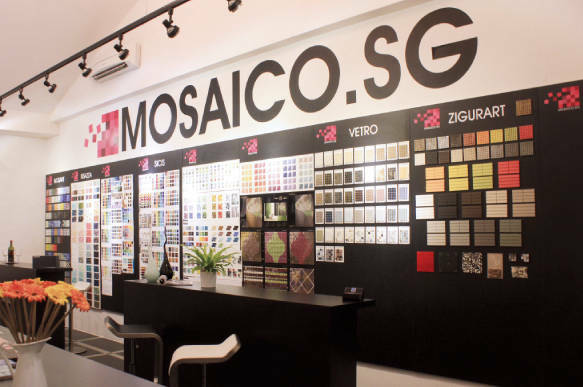 For the most comprehensive mosaic selection, head down to Mosaicoâ€™s new showroom at River Valley Road.